Photo 1: Jiangzhou Immortal Bridge in Guangxi Province, China. Photo by Ray Millar. 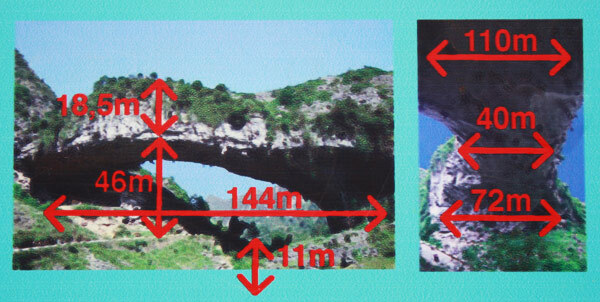 Photo 1 above presents a highly schematic illustration of three ways that Jiangzhou Immortal Bridge might be measured. Photo 2: From interpretive sign under Jiangzhou Immortal Bridge. Photo by Ray Millar. 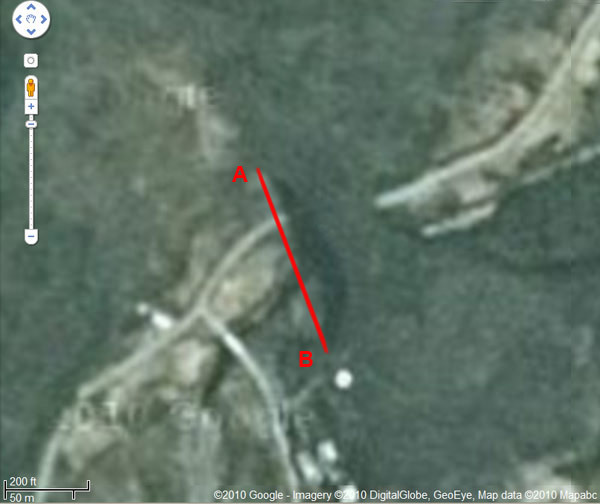 Although in the diagram the arrows do not extend all the way to the ends of the alcove, if a 144-meter line is drawn to scale on the Google Earth image of Jiangzhou Bridge, shown below in Photo 3, it appears to correspond very closely to the maximum extent of the alcove, so it seems this was indeed what was actually measured. Photo 3: Google Earth imagery of Jiangzhou Immortal Bridge. 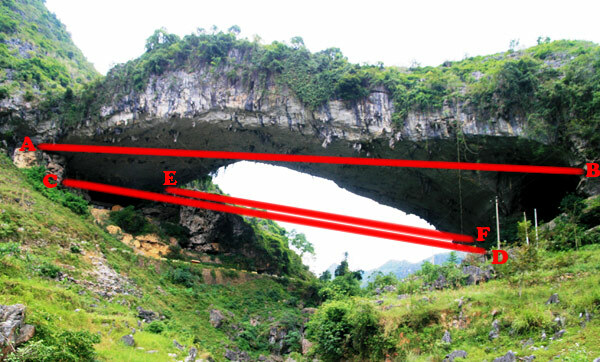 NABS, however, does not use such measurments to compare the sizes of natural arches, partly because of the difficulty in defining just what points to measure, but even more so because of the difficulty in applying this criteria to arches of differing geometries. NABS instead measures the size of the opening itself, not of any associated wider alcove, as shown in the diagram below. Line CD in Photo 1 represents a measurement made by Gunter Welz during a NABS trip led by Ray Millar in October 2010. The position of point C is fairly accurately represented on the photo, but the position of point D is not because the angle of the photo precludes that. The locations of points C and D are more accurately indicated in Photos 4 and 5 below. Photo 4 also shows point E, out of sight behind where the arrow is pointing. Photo 4: Looking north under Jiangzhou Bridge. Photo by Steve Negler. Photo 5: Looking south under Jiangzhou Bridge. Photo by Gunter Welz. The distance between points C and D was measured in a single line-of-sight measurement with a Laser Rangefinder 800 from Vollmondjagd.de, which has a range of 800 meters and a rated accuracy of ± 1 meter. The distance measured was 110 meters. 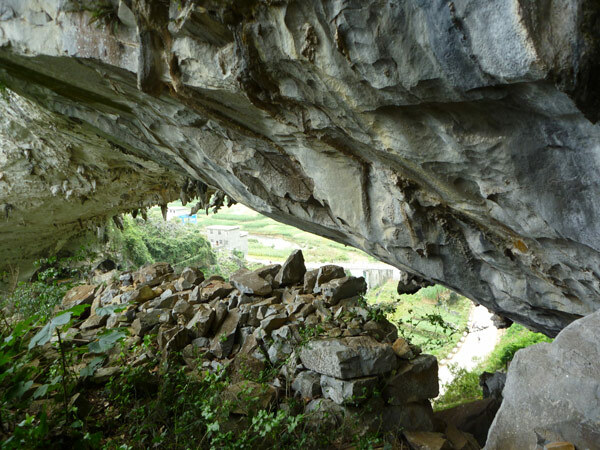 Since the span is the horizontal extent of the arch opening, this needs to be corrected by the angle from the horizontal. No equipment was available on site to make any precision measurement of this angle, so this introduced some error. The angle was calculated to be 19° using photoanalysis of numerous photos; an error of 1° in calculating this angle would result in an error of about 3 feet. Combining this error with the error associated with the rangefinder yields a result of 340 ± 6 feet. The position of point E is fairly accurately represented in Photo 1 at the top of this page, but the position of point F is not because the angle of the photo precludes that. The fact that line EF appears in the photo to be considerably shorter than line CD does not necessarily mean that points E and F represent the correct end points of the span because the angle of the photo contributes considerably to the shorter appearance of this line. However, it does mean that points E and F are possible candidates for the correct end points and that this possibility should be investigated carefully. Photo 6 below shows the locations of points C and E.
Photo 6: The northern end of Jiangzhou Bridge. Photo by Gunter Welz. It should be noted that there is no line of sight between points E and F, which makes this distance more difficult to measure. The rocks that block this line of sight can be seen in Photo 4 above and Photo 7 below. Photo 7: Near point E, the northeast corner under Jiangzhou Bridge. Photo by Steve Negler. 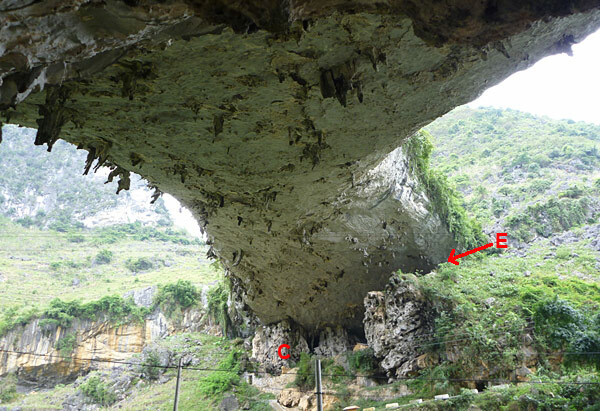 At this time there is not enough information to determine whether point E or point C is the correct northern end point for the span. Since there is no line of sight between points E and F, determining which point is correct cannot be done quickly with a laser rangefinder, and limited time on this visit prevented a more detailed examination. In addition, eyewitness perceptual estimates vary markedly. One person reports that point E is "definitely farther back" than point C (i.e. farther away from the southern end of the span). Another person reports that point E is as much as 50 feet or more closer to the other end of the span than is point C. Hence, reports based on visual perception alone cannot be used to settle the question; further data will be needed. It should be noted that points D and F may or may not be the same points. If point C is the correct northern point, it appears that point D was correctly chosen as the southern point. 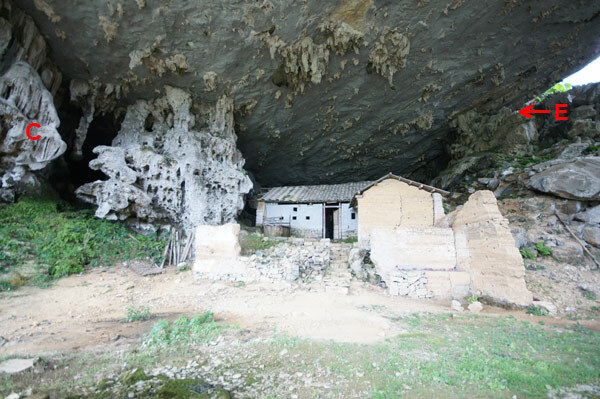 Imagine, if you will, that there are no rocks blocking the view between points E and F, and imagine that you have a piece of chalk tied to a string that can be stretched straight between these two points, unhindered by intervening rock. If you were to stretch this string taught from point E, then point F would be the point where the greatest length of string would result in the chalk making contact with the lower end of the span at only one single point. If there were line of sight, panning with a laser rangefinder could locate this point very quickly, but that was not the actual case here. Photoanalysis and one perceptual estimate indicate that point F might in reality be a bit east of point D (i.e. to the left of point D in Photo 5). Whereas there is no field measurement of the horizontal distance between points E and F, photoanalysis, including such techniques as triangulation with distant landmarks visible both in photos and in Google Earth, provides a lower limit of this distance at around 280 feet. 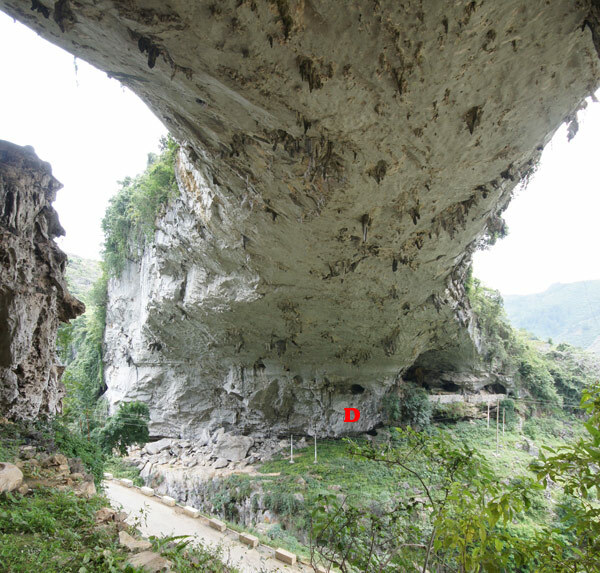 If correct, this would place the span of Jiangzhou Immortal Bridge quite close to that of Landscape and Kolob arches. Accurately ranking the span of Jiangzhou Bridge might therefore require a measurement as precise as currently exists for those two arches. However, if any data can eliminate point E from consideration as the correct northern end point of the opening, then the span of Jiangzhou Bridge would be known to be about 340 feet and it's ranking as the second-greatest span in the world would be confirmed.